The club is run on a termly basis between years 3 and 4 with a maximum of 20 children to maximise safety and playing time for all. 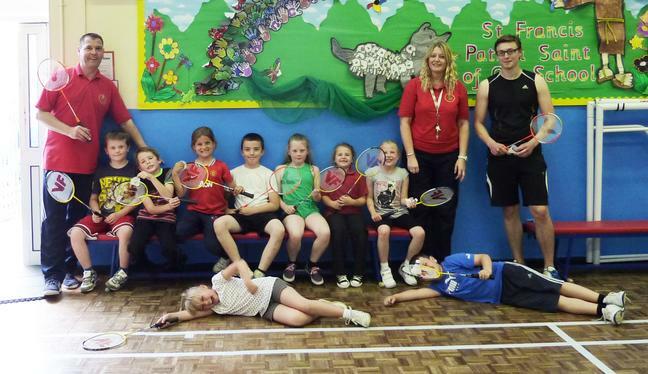 The Bisi course (Badminton In Schools Initiative) was delivered by a Badminton Wales Development officer, for our school to continue to improve the skills of Badminton of our pupils. The children practice their skills, leading towards playing other schools and taking part in leisure centre tournaments. Badminton is great. It provides an environment for fun, fitness, social interaction and competition. The Bisi programme offers that first step to progress from beginner to medal winner. Bisi Badminton Primary is aimed at pupils who are beginning their physical education journey within the National Curriculum. Bisi activities and resources map closely to the National Curriculum Key Stages. The Primary resources cover Foundation and Key Stage 2, and are specifically designed to support the delivery of activities that contact elements of the National Curriculum – gymnastics, dance, games, outdoor and adventurous activities. Completing these Bisi activities will contribute towards children meeting National Curriculum expectations. Badminton talent identification activities are also integrated into the units.